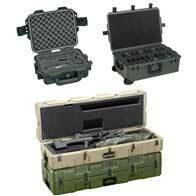 Sensitive equipment and crucial supplies arrive ready to deploy in Mobile Master™ 463L pallet-ready cases. Non-slip ribs stack all four sizes firmly together to get the maximum usable space per pallet while no moisture or contaminants get through to the supplies. Chemical resistance makes international delivery a breeze and lightweight materials let you pack more goods per shipment. By sea, air or truck – nothing ships more efficiently than Mobile Master. 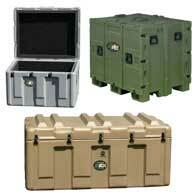 Pelican-Hardigg™ Mobile Medical™ Cases are rotomolded, watertight, airtight and impact resistant cases that feature battle-tested endurance with the perfect combination of customizable inserts and options to organize and protect lifesaving medical gear. 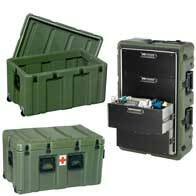 From administrative to in-the-field portable units, each case is designed to exact performance standards with the input of military medical professionals in tandem with the expert engineers of Pelican-Hardigg. Whenever lightweight mobility, fast access and protected equipment is demanded, Pelican-Hardigg Mobile Medical delivers. When there is an onslaught of paperwork, procurement professionals know the Pelican™ Mobile Office™ is there with organization. 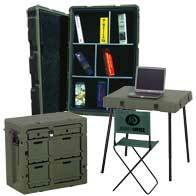 Soldiers, in minutes, can set up a field office using lightweight, watertight, chemical-resistant and durable Field Desks, Admin Desks, and Bookshelves. And for personal gear storage, nothing beats a secure Footlocker and Trunklocker.